Well, it’s official, I am now the proud owner of Apple’s newest electronic marvel, the iPad 2. Getting one was a bit of an ordeal, however, and the story deserves to be told. First off, I know many of you are already shaking your heads about getting an iPad at all since I already had a first generation iPad, but hear me out. When I first bought my iPad last year I wrestled with the decision given that, at the time, I thought it was going to be nothing more than an expensive toy. I had a difficult time justifying spending that kind of money on something that I felt wouldn’t be useful beyond a few nifty apps and reding the news. Once I got my iPad, however, I realized just how valuable it would be as a companion to my computer. I quickly learned how to do e edgy ing from my lesson plans to my grade book on Apple’s magical device. It has now become as necessary a gadget as my cell phone (another device I was resistant to at first). I was never an Apple FanBoy and would never have considered waiting in line for an Apple product (in fact I was probably one of those people making fun of those people in line). All that changed with the release of the iPad 2. I set out to find the new iPad on Friday, release day, right after work. I anticipated a line so I left as soon as I could. When I arrived, the line was not only long, it went down a block and around the back of the building. I got in line and they began handing out tickets for guaranteed sales. They claimed that the tickets were half of their stock. Given that I was six people away from the last person with a ticket, I figured that I had a pretty good chance of getting one. 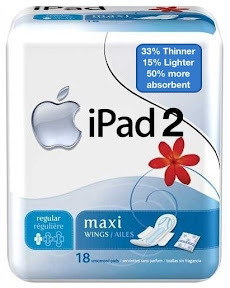 I mean how many people were really going to buy two iPads? Needless to say, after waiting in line for nearly three hours and getting within six people of the doors of the store they announced, to me and the two hundred people still behind me, that they were sold out. I left the Apple Store empty handed and a bit disheartened, but I knew this was a possibility so I took it with a grain of salt and figured that it just wasn’t meant to be. I resolved myself to just living with the one that I had and getting a new one later on when they were more readily available. Yeah, right! I was obsessed! I couldn’t just let this go, I called every store in the area to see if they had any in stock. Every Walmart, Target, Best Buy and Apple Store had all sold out. I made it through the weekend without too much disappointment and continued to check around on the off chance that someone may get one in. I figured that, since it was Spring Break and I had the time, I would stop in on Monday. The Apple store was bound to get another shipment in. Ok, now you’re just being mean! I left, a bit more disappointed and a LOT more disheartened. I couldn’t believe I was THAT close only to be turned away, yet again. I left the store and once again called every store within driving distance. No one had any. I stopped in at the Best Buy in Grapevine, since it was right across the street at that point and figured I’d just stop in rather than calling. The Geek Squad member informed me that while they were sold out, they would take reservations for $100 down. I contemplated it for a moment thinking of many bad experiences with Best Buy, but I figured it was better than driving myself crazy. I put down the $100 and felt better knowing I would at least have a new iPad in a week or two. I could have ordered it online, but I would have had to wait two weeks to a month any way and at least if something was wrong, Best Buy would be there to return it to. I went home and worked on my book for the rest of the afternoon. Out of curiosity I kept checking local retailers online to see if any stock showed up. Nothing. Around 2 in the afternoon I got on Best Buy’s website on a whim. The iPad I wanted was in stock at the Best Buy in Grapevine. I called, just to see what they would say. An associate named Melissa answered and said they had none in stock. Within 2 minutes of hanging up the phone, I got a call back from Melissa that my iPad was in. I’d go into the amount of rejoicing I went through at that point, but I’ll spare you the details. Needless to say I was a very happy camper at that point, having left promptly to get to Best Buy before my luck ran out. They were the only store in the Metroplex to have gotten a shipment of the iPad I wanted. The whole ordeal makes me appreciate that I was able to get one when I did, I never expected to be able to find one. I thought I would have to wait a month before they were available again. My mom is also happy because she is the recipient of my old iPad, she and my niece will enjoy every second of it. In the mean time, for all of you who think I’m crazy for going through what I went through to get one, remember, there’s something in your life you’ll get just as excited about.